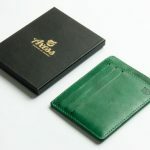 Green Wallets. Saint Patrick’s Day. Slim design. Pretty sure that’s all the convincing you need to buy this. 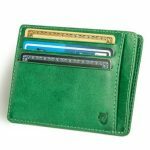 It looks great, holds enough cards, and it’s green! 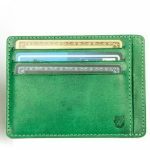 The wallet is handmade by experienced craftsmen working with the high end genuine Italian Vegetable tanned leather. The stitching is tight and strong with durable Polyester/Cotton Corespun Thread. The edges are hand cut. This model is made in full grain vegetable tanned leather from the renowned leather district of Tuscany in Italy. This carefully crafted leather will adapt to your use and develop a rich and deeply textured patina over time. 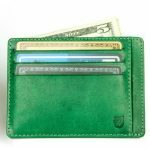 Vegetable tanned leather actually becomes better with time and use, creating a wallet that will transform in front of your eyes and have a much longer lifespan than most commonplace wallets on the market.